Welcome to India’s best preserved secret - The Andaman Islands. Located in the Bay of Bengal and measuring 700 kms from North to South is a sprinkling of 572 alluring Islands of which only 36 are inhabited. Part of the Indian Sub- Continent and known as the Andaman and Nicobar Islands, these undulating isles hold a rustic and ethereal charm that remains unfazed by time. After years of isolation, the Government has in the past decade or so begun to allow environmentally conscious tourism in the Andamans. However the Nicobar Islands remain inaccessible and tourists (both Indians & Foreign nationals) are strictly not allowed to visit this group of Islands. All flights arrive at the Veer Savarkar Airport in the capital city of Port Blair. All Foreign Nationals are requested to visit our FAQ section and read about the Visa and permit requirements to visit the Andamans. For those with no constraint on time and a strong stomach, a ship voyage can be interesting (and inexpensive) as you get to meet with both Andaman islanders as well as mainland Indian travelers. The history of the Andaman and Nicobar Islands lies shrouded in mystery and legend. Apart from brief interludes where the Cholas and Marathas used parts of the Andaman and Nicobar as a base, sporadic exploratory missions by European naval powers and fleeting references from travellers such as Marco Polo, the history of the Andaman Islands is that of the aboriginal inhabitants, some of whom still remain in varying degrees of solitude. The more recent history of the Andamans starts with the establishment of British bases and a penal colony in the 18th century. The construction of the infamous Cellular Jail "Kalapani" or "Black Waters" (Parents often warned their truant children that they would be sent to Kalapani if they did not behave) was completed in 1908 at the cost of Rs. 500,000. Every brick used in its construction was brought in from Burma and the prisoners themselves were made the laborers. During the British occupation, Islands were named after Generals who fought during the great Indian Mutiny of 1857, and till date these Islands retain those very same English names. Several Islands including Port Blair, Havelock, John Lawrence, Henry Lawrence, Duncan Island, Nicholson Island and many more can be sited as examples of this. With the Second World War, Japanese troops occupied the islands and the local tribes initiated guerrilla activities to drive them out. Under Japanese occupation, several bunkers were built all around these Island, many of which are still standing. On 29th December 1943, Netaji Subhash Chandra Bose hoisted the flag of independent India on the island. He also established the first independent government here. Netaji renamed these islands as 'Swaraj' (Self-rule) and 'Shaheed' (Martyr). General Loganathan of the Indian National Army was appointed as the Governor of Andaman & Nicobar Islands. The headquarters of the Civil Administration was set up on 21st March, 1944 near the Gurudwara at Aberdeen Bazaar. When India achieved independence in 1947, the Andaman and Nicobar Islands were incorporated into the Indian Union. The beautiful Emerald Isles have so much to offer. From places of historical importance to those of educational value, in the Andamans there is never a shortage of things to do. Marine parks, stunning beaches and beautiful snorkeling trips are just some of the adventures that await you. Why stand in a long queue to buy a ferry ticket with beads of sweat glistening on your forehead? Why haggle with a taxi driver for hours and why experience less when you can explore and enjoy so much more? Experience a hassle free holiday where everything is perfectly planned and systematically executed. Enjoy half day sightseeing tours, full day sightseeing tours and wonderful day trips all tailor made to suit your exact requirements. Avail of fantastic deals and special prices that are unbeatable. Receive the best advice and frank opinions from our specialists. Forget your worries, just pack your bags and begin dreaming. Leave us to plan the rest. Cellular Jail located at Port Blair, stood mute witness to the torture meted out to the freedom fighters, who were incarcerated in this jail. 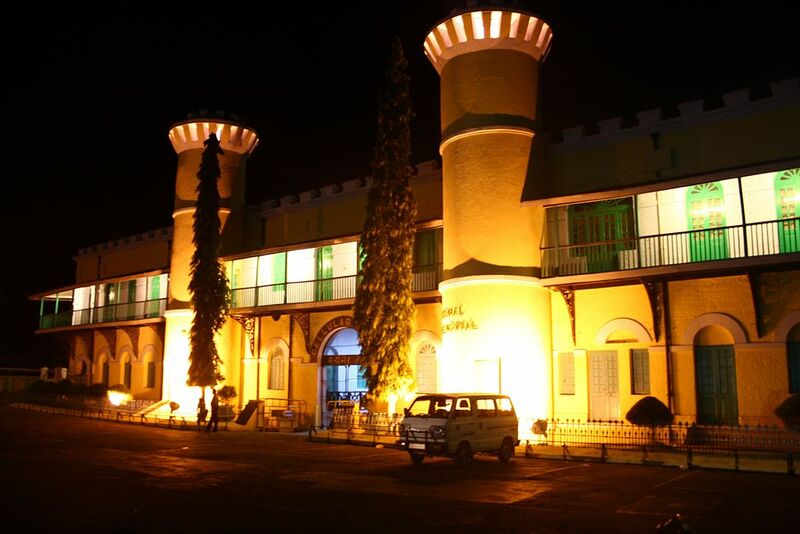 The construction of the prison started in 1896 and was completed in 1906. The original building was a puce-colored brick building. The bricks used to build the building were brought from Burma, known today as Myanmar. The Jail acquired the name cellular, because it is entirely made up of individual solitary cells which prevented any prisoner from communicating with any other. They were all in solitary confinement. The saga of the heroic freedom struggle is brought alive in a moving Son-et-Lumiere, shown daily inside the Cellular Jail compound with separate timings for English and Hindi shows. 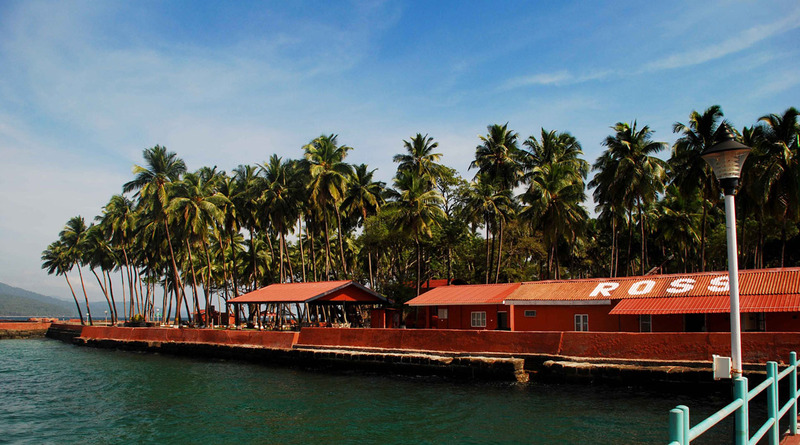 Ross Island, the erstwhile capital of Port Blair during the British regime, is a tiny island standing as guard to Port Blair harbor (10 minutes journey from the Phoenix Bay Jetty, Port Blair). 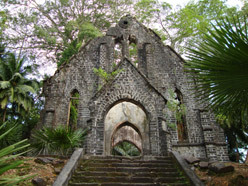 The island presently houses the ruins of old buildings like Ballroom, Chief Commissioner's house, Govt House, Church, Cemetery, Hospital, Bakery, Press, Swimming Pool and Troop Barracks, all in dilapidated condition, reminiscent of the old British regime. The island is spread over 0.6 sq kms, is popular with tourists and the Indian Navy has established a museum on the island known as "Smritika". For travellers keen on photography, this Island is intriguing and a ‘must visit’. The old buildings have nearly collapsed and bare skeletal structures remain. Held together by numerous sturdy tree roots growing into and over the structures, this is a sight not to be missed. It is a long and tiring walk to see this island and although a small cafe is present it is advised to carry drinking water and snacks. 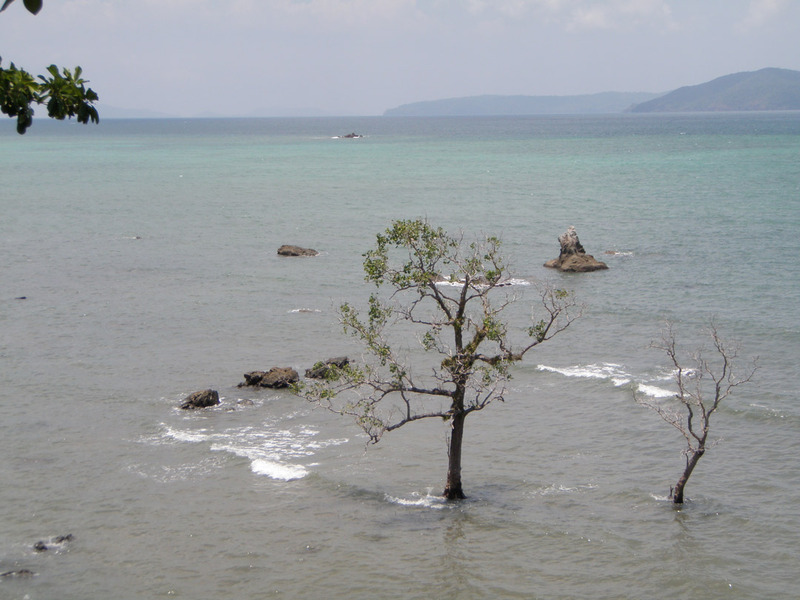 The tiny serene, beautiful island is situated inside the Port Blair harbor (20 minutes boat journey). The island derives its name from the vessel "Viper" in which Lt. Archibald Blair came to the islands in 1789 with the purpose of establishing a penal settlement. The vessel, it is believed, met with an accident and its wreckage was found near the island. Viper Island witnessed the untold sufferings the freedom fighters had to undergo. Convicts found guilty of violating the rules of the penal settlement were put in fretters and made to work on the island. Famous freedom fighters who had been imprisoned on Viper Island include Nanigopal, Nandlal Pulindas and Sher Ali. The ruins of the jail as well as the gallows can be seen on the island. 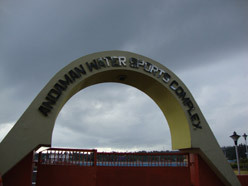 The Andaman Water Sports Complex offers facilities for safe water sports such as water skiing, water scooters, parasailing and glass bottomed boats. There is a saline water swimming pool, promenade for walking as well as changing rooms and a food plaza available near the complex. Kindly note these activities are organized by the Government and sometimes all the activities may not be available. We request you to contact us for the activities that are available closer to your dates of travel. 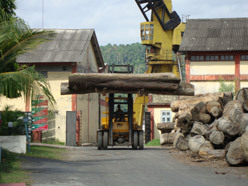 The Chatham Sawmill is one of the oldest and largest mills in Asia. 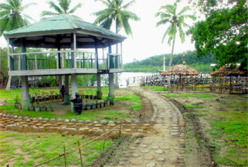 Built on a tiny island by the same name and connected to Port Blair by a bridge, the island has the second largest wharf here and also houses a Forest Museum in its premises. Owned by Forest department and dating back to 1836, it is a big store house for different varieties of wood including Marble, Padauk, Gurjan and Satin wood. The mill cuts massive wood into different sizes and shapes of timber and functions as the main source of timber at moderate prices for Government and private agencies. This mill processes many types of ornamental wood suitable for making furniture and handicrafts. The Mahatma Gandhi Marine National Park at Wandoor is at a distance of 29 kms from Port Blair covering an area of 281.5 sq kms. This marine park made-up of open sea, mangrove creeks and 15 islands, is one of the best marine parks anywhere in the world. Viewing of rare corals and underwater marine life through glass bottom boats, and snorkeling are extremely popular here. 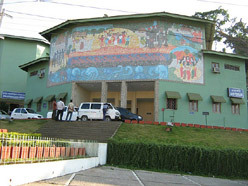 The Anthropological Museum is maintained and managed by the Anthropological Survey of India, and is located in Port Blair. It is an exquisite small museum showcasing a wide collection of tools and weapons used by the Andamanese tribes. It also exhibits photographs of different tribes and aborigines of Andaman and Nicobar Islands. A great treasure of island history, the museum also has a well maintained library. 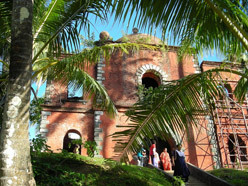 Many films depicting the life and culture of the Andamans are preserved here and the museum authorities arrange few documentary film shows for visitors. 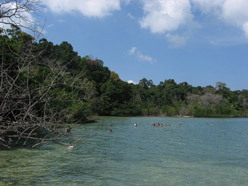 Chidiya Tapu is the southern most tip of South Andaman. Located 25 kms from Port Blair, the lush green mangroves, forest cover with numerous chirping birds and the white sand beach make it an ideal picnic site as well as a great place for snorkeling. The forest guesthouse situated on top of a hillock provides a fabulous view of isolated islands, submerged corals and the breath-taking sunset. 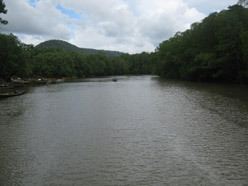 Madhuban is 75 kms by road or 20 kms by ferry from Port Blair. 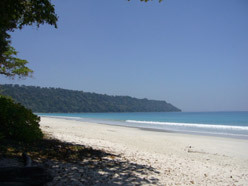 It is primarily a trekking area, north east of South Andaman. Exotic endemic birds, animals, butterflies, and elephant lumbering are the most interesting part of the trek. The summer headquarters of the Chief Commissioner during British Raj, this place is ideal for a nice and fascinating over view of the outer islands and the sea. Located 55 km, by road and 15 km by ferry from Port Blair, it is the highest peak in the South Andamans (365 meters high). One can trek up to Madhuban from here through a nature trail and can find rare endemic birds, animals and butterflies. Conducted tours to Mt. Harriet are available from Andaman Teal House. The Andaman Islands consist of 572 islands, islets & rocks of which just 36 are inhabited till date. Port Blair the capital city and Havelock Island which is the tourist hub, rate as the most popular traveler choices. However there are several other islands that intrigue travellers. From places of historical importance, to beautiful beaches, fantastic photo opportunities, great snorkeling excursions and remote destinations there is a whole lot of things that you can expect in these islands. 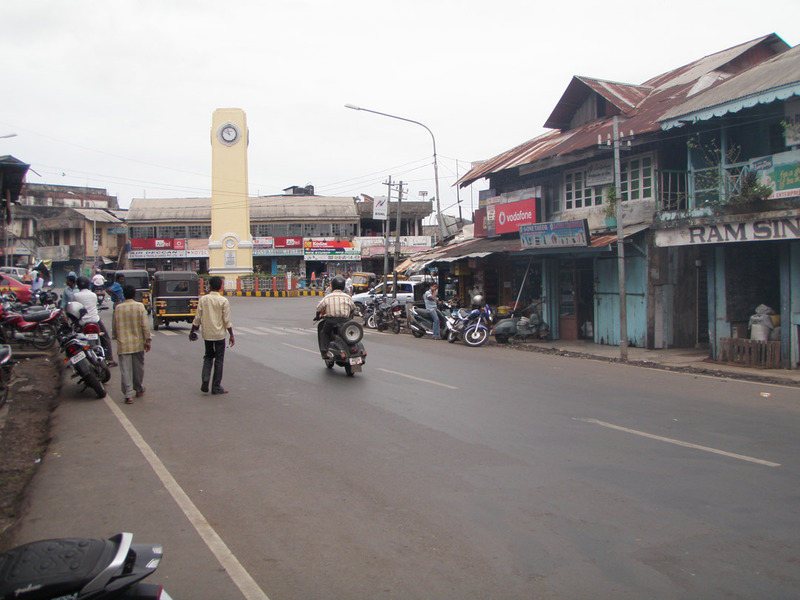 Port Blair, the capital city is a bustling overgrown town of immense historical importance. Travellers usually visit the main historical attractions, some of which are in the city and some as day trips keeping Port Blair as the base. The famous Cellular Jail (that housed Indian freedom fighters during the struggle for independence) draws hundreds of visitors and is perhaps the most visited monument in the Andamans. Travellers following the typical tourist route also visit Chatam Sawmill (one of the oldest & largest in Asia), Forest Museum, Anthropological Museum, Fisheries (Marine) Museum, Naval Marine Museum (Samudrika) and the Cottage Industries Emporium (Sagarika) to indulge in a bit of shopping. Souvenirs available here are very popular buys. 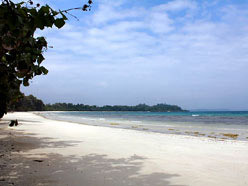 Havelock Island is the recommended island and hub of all tourist activity. It is perfect for those who wish to kick off their shoes, have a relaxing vacation or be adventurous and try various activities that include but are not limited to camping, scuba diving and snorkeling. From Port Blair, Havelock is just a ferry ride away with 3 daily departures that are easy and convenient. Located 57 kms northeast of Port Blair, Havelock has the most spectacular white sand beaches, rain forest canopies, turquoise waters and fantastic coral reefs. The water is abundant in marine life both large and small and this Island is ideal for snorkeling & scuba diving. For more information regarding places to stay in Havelock, visit this link. Deer roam the islands today, peering from behind the thick bushes, and sometimes even mustering up courage to eat biscuits out of your hand. A graveyard has headstones of army officers who died young, and that of an infant who lived for just 22 hours. Some parts are off limits for visitors. A small museum displays pictures of its old grandeur and the entire island can be explored on foot and is open every day except Wednesday. Overnight stays are not possible on this island. Viper Island is a beautiful tourist attraction and can be approached by harbour cruise originating from Phoenix Bay Jetty in Port Blair. This was the site of the old jail where the British used to house and torture convicts and political prisoners. The conditions at the jail were such that the place got the notorious name, "Viper Chain Gang Jail." Anyone who had challenged the British authority was bound and confined at night by a chain running through coupling of irons around their legs. The Jail has secured a permanent place in the history of the freedom struggle as it was here that Sher Ali Khan, was executed after he assassinated Lord Mayo, Indian Viceroy, on February 8, 1872. 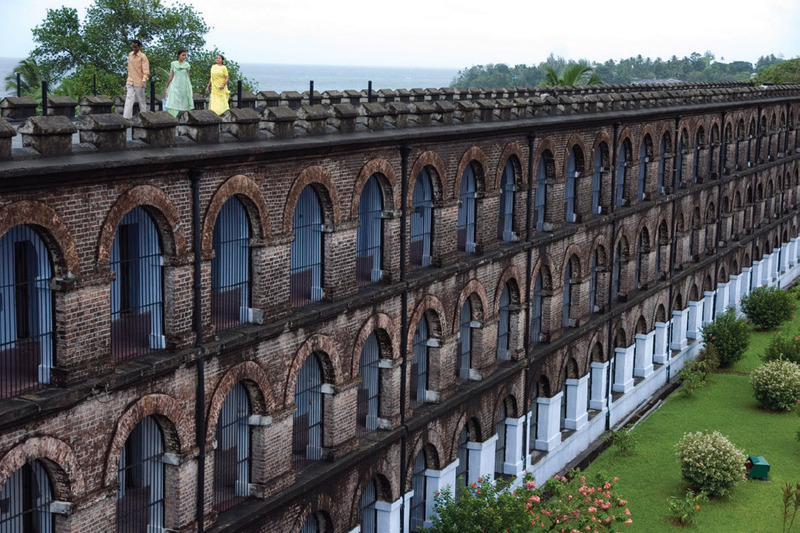 With the construction and completion of the Cellular Jail, activities at Viper island prison reduced considerably. Cinque Island is surrounded by pristine coral reefs and inviting blue waters. Uninhabited, North and South Cinque are among the prettiest islands in the Andamans. Getting to this charming island takes two hours from Chidiyatapu, and three-and-a-half hours from Wandoor by boat. Unfortunately, there are no regular boat services. Special permission must be taken from the Forest Department to visit this island. Jolly Buoy Island, in Mahatma Gandhi Marine National Park offers breath taking corals and amazing marine life. It is an ideal place for snorkeling and for basking on the sun kissed beach and getting that fabulous tan. Regular day trips ply from Port Blair to this island at present, however no night stays or camping is allowed here. Red Skin Island is also located in the Mahatma Gandhi Marine National Park has a nice beach and offers spectacular view of corals and marine life. Popular with snorkelers, this island is a great day trip from Port Blair for those looking for a fun day at the beach. Night stays are not permitted here. 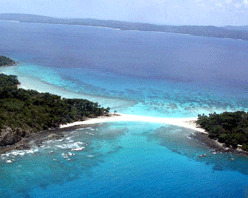 Long Island is located 82 kms from Port Blair or 35kms north of Havelock. Connected by a ferry three times a week from Phoenix Bay Jetty in Port Blair, enchanting Long island is home to a lovely sandy beach at Lalaji Bay 6 kms north from Long island jetty. 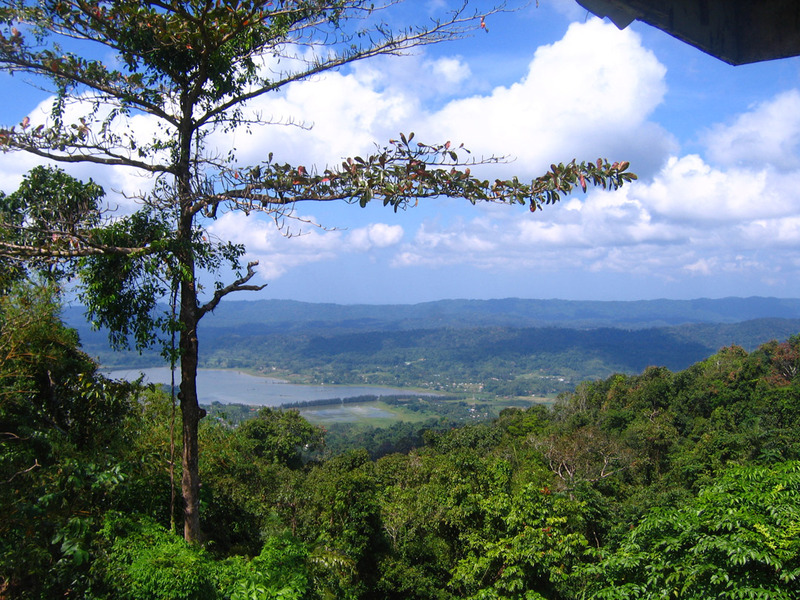 It also has beautiful forest cover and coconut plantations. Long island was uninhabited until the arrival of settlers in the 1970s. A plywood factory was established near the jetty but is now closed. A village exists near the jetty, the population of which is approximately 1500 people. The island is populated by settlers and factory workers from different parts of India. Barren Island, one of the most easterly islands is the only active volcano in South Asia, lies 135 kms northeast of Port Blair and is 300 m above sea level. The first recorded eruption of the volcano dates back to 1787 and further eruptions were recorded in 1789, 1795, 1803–04, and 1852. 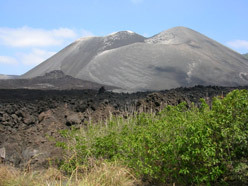 After nearly one and half centuries of dormancy, the island had another eruption in 1991 that lasted six months and caused considerable damage. There were eruptions in 1994–95 and 2005–07. Since then, the volcano has erupted more than six times; most recently on 19 July 2009 and till date continues to spew smoke and ash. South Button Island is located southwest of Havelock and is a stunning islet that is almost fairy tale like. A part of the Rani Jhansi Marine National Park, this island is extremely popular for both snorkeling and diving. Incredible marine life and stunning healthy coral await visitors here. Schools of fish like Snappers, Barracuda, Trevally, Sweetlips, Groupers, Angel fish and Butterfly fish whiz around and lucky visitors are thrilled to see Turtles, Devil Rays and Manta Rays as well. Simply awe inspiring, South Button can be visited as a day trip from Havelock. There are no beaches on this island and tourists are not allowed to climb the rocky outcrops. A pair of white bellied Sea Eagles can be spotted flying high and this island is by far the most popular snorkeling destination owing to its splendid coral and shallow depths. 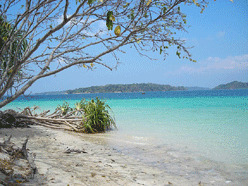 Baratang Island is a large undulating island of approximately 80 sq kms located due west from Havelock Island. It lies in a creek between the two large islands of South Andaman and Middle Andaman, and forms a ‘bridge’ between the two. 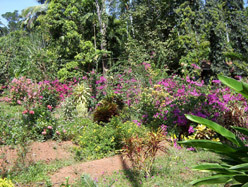 At Baratang, much of the landmass is under cultivation; however patches of denuded forest and primary forest do exist. The island is geologically significant and boasts natural marvels – mud volcanoes and limestone caves. Baratang presents wonderful short trekking opportunities through the Ranchi village off the South Creek, taking detours into a number of limestone caves. 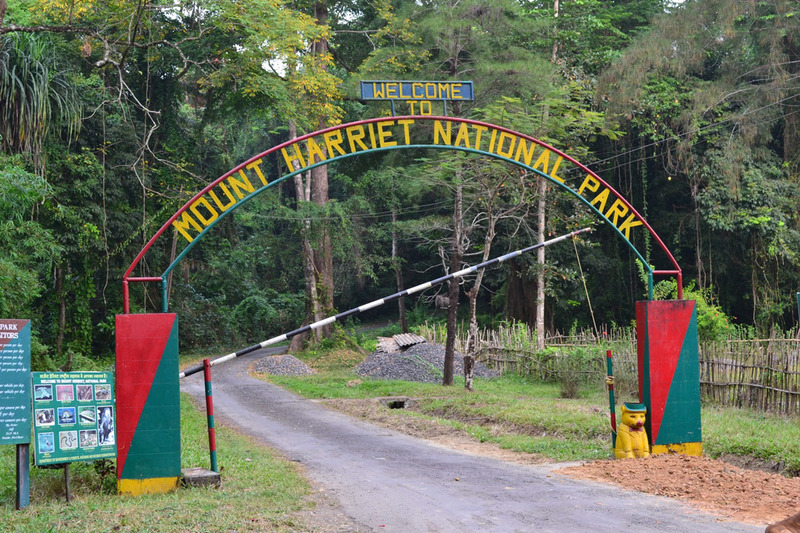 The limestone caves and mud volcanoes bring many a visitor to Baratang. 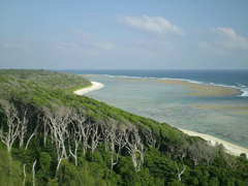 Rangat Island is 90 kms by sea and 170 kms by road from Port Blair. At Cuthbert Bay beach, near Rangat, you will find a turtle nesting ground as well. Rangat is useful as a stopover on longer itineraries involving Baratang and destinations further north. Diglipur area and Ross and Smith Islands that are joined by a bewitching sand bar, is 30 minutes away from Aerial Bay jetty near Diglipur, which is itself 120 kms by sea and 250 kms by road from Port Blair. One can feel the innocent beauty of village life everywhere in Diglipur. Diglipur is a useful base for excursions to Kalipur beach and Ramnagar beach. Saddle Peak, accessible from Diglipur, is popular for trekking/nature trail through the lush evergreen rain forest. Saddle Peak is a national park and covers an area of 33 square miles. Among the animals found here are the Andaman Wild pig, Water Monitor and the Imperial Pigeon. Kalighat, near Diglipur is a small passenger ferry terminal in the mangroves, and is connected by daily two boat services from Mayabunder. 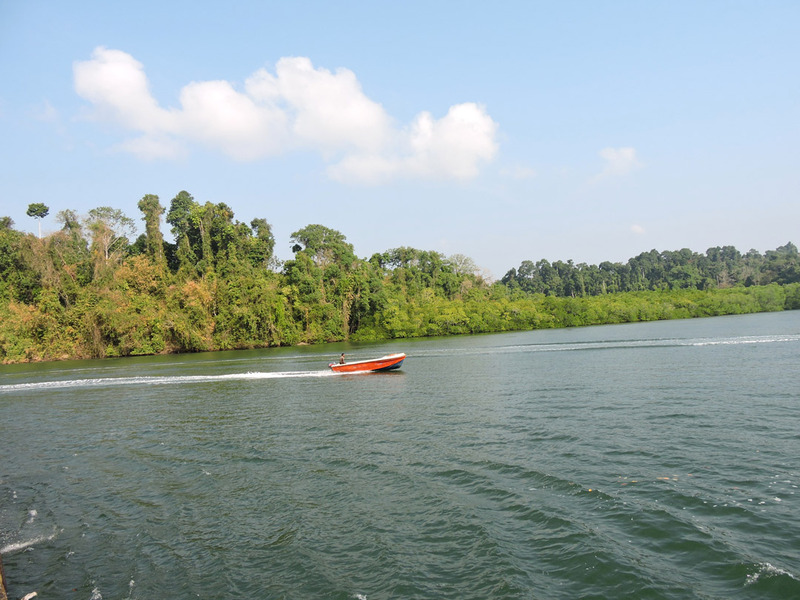 Port Blair – Diglipur (Aerial Bay jetty) boat services are also available twice a week. Little Andaman Island is 120 kms by sea from Port Blair and has a stunning beach at Butler Bay, a waterfall and plantation of oil palms. 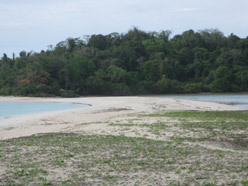 Apart from this there are several sandy beaches all along the coastline of the island. The break water at Hut Bay offers an excellent view to the tourists. Little Andaman is the vegetable bowl for the Nicobar group of islands. North Passage Island is 30 kms northeast of Havelock island, and is situated between Strait island immediately to its south (home to the last remnants of the Great Andamanese tribe), Guitar island and Long island immediately to the north. To the east of North Passage island, across the channel, lies John Lawrence island in Ritchie’s archipelago and much closer west lies the expanse of Middle Andaman. North Passage island has very little history of habitation, other than sporadic visits from different sects of the Great Andamanese Tribe.